Svetozar Marovic (right) and his wife Djordjina (Photo: Dan)The Organized Crime and Corruption Reporting Project, OCCRP, reported in 2015 that leaked documents from the Swiss Bank HSBC reveal that Djordjina Marovic, the wife of former President of Serbia and Montenegro, Svetozar Marovic, had US$3.8 million deposited in the bank in 2006/2007. Her husband and son were authorized to make transactions. The funds should have been reported in Marovic’s asset declarations, but were not. 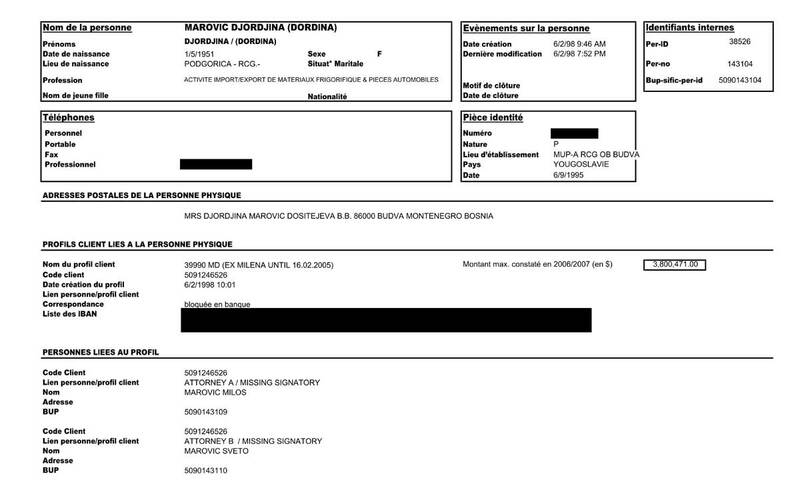 An unnamed source told the Montenegrin outlet Vijesti, that a confirmation of the existence of the account and the amount of money on it at in 2006/2007 has been provided by the Swiss authorities after a long correspondence. The day the report about the secret bank account was published in 2015, Marovic was questioned by investigators about another corruption affair. Six months later, Marovic and his son were was sent behind bars during an investigation into another corruption affair. Marovic was suspected of having led an organized criminal group that stole tens of millions of euro from the municipality of Budva. Both were released pending trial but the family moved to Belgrade and remains unavailable to Montenegrin authorities.